2 World Trade Center (also known as 200 Greenwich Street) is a skyscraper under construction as part of the World Trade Center complex in Manhattan, New York City. It will replace the original 2 World Trade Center, which was completed in 1972, and subsequently destroyed during the September 11 attacks in 2001, and it will occupy the position of the original 5 World Trade Center. The foundation work was completed in 2013. Viewers atop old Two World Trade Center observation deck looking north toward mid-Manhattan. When completed in 1973, 2 World Trade Center (the South Tower) became the second tallest building in the United States—outmatched only by its twin, 1 World Trade Center. The South Tower's rooftop observation deck was 1,362 ft (415 m) high and its indoor observation deck was 1,310 ft (400 m) high. The World Trade Center towers held the height record only briefly: the Willis Tower in Chicago, finished in May 1973, reached 1,450 feet (440 m) at the rooftop. Throughout its existence, however, the South Tower had more floors (at 110) than any other building. This number was not surpassed until the advent of the Burj Khalifa, which opened in 2010. Of the 110 stories, eight were set aside for technical services in mechanical floors (floors 7/8, 41/42, 75/76, and 108/109), which are four two-floor areas that evenly spaced up the building. All the remaining floors were free for open-plan offices. Each floor of the towers had 40,000 square feet (3,700 m2) of space for occupancy. The original Two World Trade Center had 95 express and local elevators. The tower had 3,800,000 square feet (350,000 m2) of office space. Initially conceived as a complex dedicated to companies and organizations directly taking part in "world trade", the South Tower, along with 1 World Trade Center (also known as the North Tower) at first failed to attract the expected clientele. During the early years, various governmental organizations became key tenants of the World Trade Center towers including the State of New York. It was not until the 1980s that the city's perilous financial state eased, after which an increasing number of private companies—mostly financial firms tied to Wall Street—became tenants. During the 1990s, approximately 500 companies had offices in the complex including many financial companies such as Morgan Stanley, Aon Corporation, Salomon Brothers and the Port Authority itself. The basement concourse of the World Trade Center included The Mall at the World Trade Center, along with a PATH station. Electrical service to the towers was supplied by Consolidated Edison (ConEd) at 13,800 volts. This service passed through the World Trade Center Primary Distribution Center (PDC) and sent up through the core of the building to electrical substations located on the mechanical floors. The substations stepped down the 13,800 primary voltage to 480/277 volt secondary service, and then further down to 208/120 volt general power and lighting service. The complex also was served by emergency generators located in the sub-levels of the towers and on the roof of 5 WTC. The 110th floor of 1 World Trade Center (the North Tower) housed radio and television transmission equipment; access to the roof of 1 WTC was controlled from the WTC Operations Control Center (OCC) located in the B1 level of 2 WTC. At 9:03 a.m. EDT on September 11, 2001, five terrorists crashed United Airlines Flight 175 into the southern facade of the South Tower. Three buildings in the World Trade Center complex, including 2 WTC, collapsed due to fire-induced structural failure. The light construction and hollow nature of the structures allowed the jet fuel to penetrate far inside the towers, igniting many large fires simultaneously over a wide area of the impacted floors. The fuel from the planes burned at most for a few minutes, but the contents of the buildings burned over the next hour to hour and a half. The fires might not have been as centrally positioned, nor as intense, had traditionally heavy high-rise construction been standing in the way of the aircraft. Debris and fuel would likely have remained mostly outside the buildings or concentrated in more peripheral areas away from the building cores, which would then not have become unique failure points. In this scenario, the towers might have stood far longer, perhaps indefinitely. The fires were hot enough to weaken the columns and cause floors to sag, pulling perimeter columns inward and reducing their ability to support the mass of the building above. 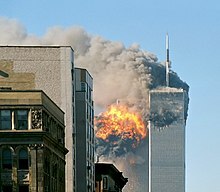 The South Tower collapsed at 9:59 a.m. after burning for 56 minutes in the fire caused by the impact of United Airlines Flight 175 and the explosion of its fuel. The new 81-story building, if erected, will have a total height of 1,340 feet (410 m). In comparison, the Empire State Building's roof at the 102nd floor is 1,250 feet (380 m) tall, 1,454 feet (443 m) with its antenna, and the original 2 World Trade Center (referred to as the South Tower) was 1,362 feet (415 m). The tower was originally designed by Foster and Partners, based in London, but has since been redesigned by the Bjarke Ingels Group (BIG). In Foster and Partners' design, the structural engineer for the building was WSP Cantor Seinuk, who has been retained for the building's redesign by BIG. In the original plan, the building's sloping roof consisted of four diamonds inclined toward the memorial that would have provided a visual marker around the skyline of just where the original towers were. The tower was designed to resemble a diamond, with cross bracing intersects and indentations breaking up the sides. The Port Authority of New York and New Jersey said the following about 200 Greenwich Street's wedged rooftop: "Designed by Lord Foster, the tower incorporates WTC master planner Daniel Libeskind's 'wedge of light' concept, and will cast no shadow on the memorial park on September 11." The total floor space of 200 Greenwich Street was anticipated to include 2,400,000 square feet (220,000 m2) of office space and another 130,000 square feet (12,000 m2) for retail shops and access areas to the underground World Trade Center PATH station. On June 9, 2015, Wired magazine first reported that Two World Trade Center would be newly redesigned by Bjarke Ingels of Bjarke Ingels Group (BIG), and be built by 2020. The bottom half of the new design would have been leased out to 21st Century Fox and News Corp until they decided against leaving their current headquarters. Bjarke Ingels Group began redesigning 2 World Trade Center in December 2014, upon the requests of the property's developer Silverstein Properties and its possible future media tenants. The project's redesign was warranted since financial firms had since migrated away from the Financial District, making leasing out the new buildings a struggle and further prolonging the World Trade Center's redevelopment. Financial firms were the intended occupants for Foster and Partners' 2 World Trade Center, and the original proposal's sky lobby design was not attractive to media tenants, who have been the leading tenants of the new WTC towers and are now expected to occupy BIG's redesigned building. The latest design features a cantilevering structure viewed from a northern perspective, but a terraced structure from an eastern perspective. From the south and west, the building's profile is vertically straight, but appears to be leaning slightly towards One World Trade Center because of the cantilevering design. In an interview, Bjarke Ingels described the concept of the redesign as such: "Two World Trade is almost like a vertical village of bespoke buildings within the building, that also can be seen as a single tower. It actually has an inclination towards One World Trade Center, so the two towers – even though they're not twinning – by having a mutual relationship, the space between them is parallel, although at an incline." The tower has also been described to integrate Tribeca with the Financial District, as the design's cantilevers and terraces resemble the modern architecture known of the neighborhood. The first three floors of the 2,800,000 square feet (260,000 m2) office building, including the ground level, will feature about 100,000 square feet (9,300 m2) of retail space. The tower will be the second–tallest skyscraper on the World Trade Center site following One World Trade Center. After the pulling out of News Corp and 21st Century Fox, the future of the site became uncertain, with calls for the tower's design to be reverted to its original incarnation. In a press interview, site developer Larry Silverstein signaled that both the Foster and BIG site plans were under consideration, and that a choice between the two would be made by a future prospective tenant. In February 2019, Silverstein suggested in an interview that construction may soon begin "on spec", or without an anchor tenant, given the strong economy and leasing progress made on neighboring towers. Excavation for 200 Greenwich Street commenced in 2008 and the building was originally scheduled to be completed sometime between 2011 and 2016. On May 11, 2009, however, it was announced that the Port Authority of New York and New Jersey was seeking to reduce the tower to a "stump" building of approximately ten stories. The overall plan, which also calls for a similar reduction in height for 3 World Trade Center and the cancellation of 5 World Trade Center, would halve the amount of office space available in the fully reconstructed World Trade Center to 5 million square feet (465,000 square meters). The agency cited the recession and disagreements with developer Larry Silverstein as reasons for the proposed reduction. The plan has seen some opposition; a May 2009 piece in the New York Post challenged the necessity of the office space reduction, given Lower Manhattan's low commercial vacancy rate compared to other U.S. cities and overall demand for modern office properties. Silverstein is opposed to the plan, and filed a notice of dispute on July 7, 2009. By doing so, the development firm began a two-week period during which renegotiated settlements and a binding arbitration regarding the construction of the four World Trade Center towers can be made. Silverstein Properties, which has paid the Port Authority over $2.75 billion in financing, noted the organization’s inability to meet construction obligations in its official complaint. The development firm has proposed further government intervention in the project as a way of settling the dispute. On December 2, 2009, a US$2.6 billion tax-free bond issue for the building's construction was approved by the state of New York to continue construction on the World Trade Center site. The construction of Two World Trade Center, however, remained on-hold. On March 25, 2010, the Port Authority released plans to build Two and Three World Trade Center to street level. The transit and retail podium at the 175 Greenwich Street site would be constructed immediately, but the construction of Tower 3 would be delayed until Silverstein Properties obtains financing for the remaining cost of the tower. Tower 3 will be built, but Tower 2's office construction will wait until the economy improves. Tower 2 foundation work began on June 1, 2010, but construction was halted in August 2012. The street-level foundation was finished by November 2012 and construction of everything up to street level was completed in mid-2013. The rest of the building, however, has yet to be built unless tenants for Tower 2 can be found. On February 11, 2019, Larry Silverstein said in an interview that he was considering building the tower without a signed tenant. He stated, "For all intents and purposes, it wouldn’t be a bad idea to start on Tower 2 because it won’t be finished until about 2022, 2023." In 2013, Citigroup had shortlisted the tower as one of three potential locations for its headquarters for when its lease on 399 Park Avenue expired in 2017. The company eventually chose nearby 388 Greenwich Street, however: a building that it already had under lease. Silverstein has faced considerable difficulty in persuading tenants to lease floorspace in Two World Trade Center. Most commonly, businesses ultimately decide against doing so because of the costs of moving in, but others prefer their current locations in Midtown Manhattan despite the leases sometimes being more costly, since Midtown Manhattan offers easier access to the Upper East Side, Long Island, Westchester, and Connecticut. Silverstein has tried to appeal to the Downtown's proximity to nearby Brooklyn, the residence of many technology and media companies' employees. At present, prospective companies either are too large to be housed adequately in 2 World Trade Center (such as Facebook or Google), or conclude it would save money to remain where they are (such as News Corp and Fox Corporation). Bloomberg Business reported on June 2, 2015, that News Corp and 21st Century Fox, both owned by Rupert Murdoch, had signed a non-binding agreement with the Port Authority of New York and New Jersey to create a joint headquarters at Two World Trade Center. Silverstein said, "A decision by 21st Century Fox and News Corp. to move to the new World Trade Center would cap a seismic shift that has taken place in Lower Manhattan over the past decade. This isn’t your grandfather’s Wall Street." The change of lead architects, from Norman Foster to Bjarke Ingels, was dependent on the Murdoch companies' relocations to the site; a redesign was deemed necessary given the different requirements for TV studios as opposed to financial companies, the assumed major tenants for the Foster design. Ingels's design would be kept at the same height as Foster's, but it was unclear how the redesign would conflict with the below-grade work already completed, which conformed to the original building design. On January 15, 2016, it was reported that the two companies had decided against moving into 2 World Trade Center, instead keeping their current headquarters on the Avenue of the Americas. They had concluded that "given the scale of investment in a relocation of this size, that [sic] our resources would be better directed elsewhere." In September 2017, Deutsche Bank was considering relocating their U.S. headquarters to 2 WTC, signing on as anchor tenant once their lease expires at their current location along nearby 60 Wall Street. In two separate instances in September 2017, Silverstein said that the tower had a planned completion date of 2022. However, in May 2018, it was announced the bank was instead relocating to Time Warner Center at Columbus Circle. ^ "Two World Trade Center". Emporis.com. Retrieved May 17, 2009. ^ a b "The Status of the World Trade Center Complex, 13 Years Later". Curbed. September 11, 2014. Retrieved December 2, 2014. ^ Greg Smith (September 6, 2014). "Port Authority delays 1 World Trade Center opening as project takes more time, money than expected". NY Daily News. ^ Mcdowell, Edwin (April 11, 1997). "At Trade Center Deck, Views Are Lofty, as Are the Prices". The New York Times. Retrieved September 12, 2009. ^ "Burj Khalifa – The Skyscraper Center". Council on Tall Buildings and Urban Habitat. Archived from the original on March 20, 2014. ^ Baldwin, Derek (May 1, 2008). "No more habitable floors to Burj Dubai". Gulfnews. Archived from the original on March 28, 2014. Retrieved January 7, 2010. ^ The World Trade Center — Facts and Figures Archived September 23, 2014, at the Wayback Machine. Nysm.nysed.gov (February 26, 1993). Retrieved on 2014-06-23. ^ Fischbach, Amy Florence (January 1, 2001). "Towering security". CEE News. Archived from the original on October 21, 2006. Retrieved March 8, 2007. E-J Electric set four generators on the roof of Tower 5, which was nine stories, as opposed to the 110-story Towers 1 and 2. E-J then ran high-voltage feeder cable to Towers 1, 2, 4 and 5, installed three substations and distributed power to the tenants. ^ a b Miller, Bill (May 1, 2002). "Skyscraper Protection Might Not Be Feasible, Federal Engineers Say". Orlando Sentinel. Retrieved November 24, 2013. ^ Field, Andy (2004). "A Look Inside a Radical New Theory of the WTC Collapse". Fire/Rescue News. Archived from the original on June 19, 2006. Retrieved July 28, 2006. ^ Gross, John L., Therese P. McAllister (2004). "Structural Fire Response and Probable Collapse Sequence of the World Trade Center Towers" (PDF). Federal Building and Fire Safety Investigation of the World Trade Center Disaster NIST NCSTAR 1–6. National Institute of Standards and Technology. Retrieved November 24, 2010. ^ Wilkinson, Tim (2006). "World Trade Center – Some Engineering Aspects". Retrieved July 28, 2006. ^ National Construction Safety Team (September 2005). "Executive Summary". Final Report on the Collapse of the World Trade Center Towers (PDF). NIST. ^ a b c d YIMBY, New York (June 11, 2015). "Interview: Bjarke Ingels On New Design For 200 Greenwich Street, Aka Two World Trade Center". New York YIMBY. Retrieved June 15, 2015. ^ "Towers 2, 3, 4, 5, 7". The Port Authority of New York and New Jersey. Archived from the original on November 8, 2009. Retrieved September 30, 2015. ^ Rice, Andrew (June 9, 2015). "Revealed: The Inside Story of the Last WTC Tower's Design". Wired. Retrieved June 14, 2015. ^ a b Gieger, Daniel (January 15, 2016). "Fox, News Corp. back out of move to 2 World Trade Center". Crain's New York Business. Retrieved January 20, 2016. ^ "200 Greenwich Street / 2 WTC Building Facts" (PDF). World Trade Center. Retrieved June 15, 2015. ^ "It's Time to Bring Back Norman Foster's Design for 2 World Trade Center – New York YIMBY". New York YIMBY. July 1, 2016. Retrieved November 19, 2018. ^ "Larry Silverstein Tells YIMBY Foster's Design for 200 Greenwich Still A Contender, More – New York YIMBY". New York YIMBY. September 11, 2018. Retrieved November 19, 2018. ^ a b c Feiden, Doug (May 11, 2009). "Agency wants to dump 3 skyscrapers from site, shrinking 2 into 'stumps'". New York Daily News. Archived from the original on May 23, 2009. Retrieved May 20, 2009. ^ Cuozzo, Steve (February 26, 2009). "Build 'Em Now NYC Needs Modern Offices". New York Post. Retrieved May 30, 2009. ^ a b "Silverstein Properties Statement Regarding Notice of Dispute Letter Sent to Port Authority". Silverstein Properties. Retrieved July 11, 2009. ^ Gralla, Joan. "NY agency OKs tax-free debt for World Trade Center". Reuters. Archived from the original on December 7, 2009. Retrieved December 11, 2009. ^ a b "Joint Statement on World Trade Center Development". Port Authority of New York and New Jersey. March 25, 2010. Retrieved March 25, 2010. ^ Construction Update: Two World Trade Center Still Stalled. New York Yimby. Retrieved on June 23, 2014. ^ WTC Construction Update, November 2012 || News || World Trade Center ||. Wtc.com (December 23, 2013). Retrieved on 2014-06-23. ^ "World Trade Center Complex on Way to Completion". ABC News. Associated Press. September 11, 2014. Archived from the original on September 12, 2014. Retrieved December 2, 2014. ^ "Citigroup eyes HQ spots as clock ticks on Park Ave lease". The Real Deal. Korangy Publishing Inc. Retrieved October 3, 2013. ^ a b Putzier, Konrad (January 21, 2016). "Murdoch snub exposes Silverstein's 2 WTC dilemma". The Real Deal. Retrieved January 25, 2016. ^ "Fox, News Corp. Have Tentative Pact For Trade Center Move". Retrieved June 30, 2015. ^ "21st Century Fox, News Corp Considering Move to World Trade Center". Dow Jones Business News. April 24, 2015. Retrieved May 1, 2015. ^ "Murdochs abandon 2 World Trade, Silverstein soldiers on". Politico PRO. Retrieved April 23, 2018. ^ "Deutsche Bank may be eyeing move to 2 World Trade Center". New York Post. September 5, 2017. Retrieved September 29, 2017. ^ "EXCLUSIVE: A Conversation With The Man Who Rebuilt The World Trade Center After 9/11 – TV". Bisnow. September 10, 2017. Retrieved September 29, 2017. ^ "Deutsche Bank will move from Wall Street to Columbus Circle". New York Post. May 5, 2018. Retrieved April 16, 2019. 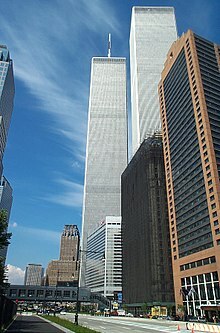 Wikimedia Commons has media related to Two World Trade Center. "2 World Trade Center". SkyscraperPage.